Team — Maxey Seat Cover Center, Inc.
Over a hundred years of experience is shared between our staff to ensure professional attention to the highest of details! 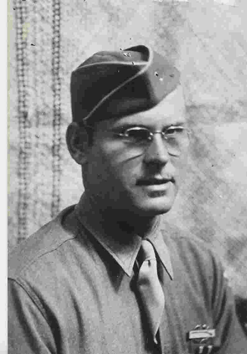 Perry before leaving for WWII. April 2001 marked the end of an era for Maxey Seat Cover and Auto Tops. Perry O. Maxey, founder of Roanoke Seat Shop, Auto Seat Cover Center and founder of Maxey Seat Cover Center in 1954, passed away from a long battle with heart disease. He was a recipient of the Purple Heart with Oak Leaf Cluster & Bronze Star with commendation along with other awards for his efforts with the 3rd Division who are known for the tremendous battles they fought on the Anzio Beach in Italy during WWII. On Feb 2, 1954, Perry opened his first shop on 11th street in Northwest Roanoke. His services ranged from convertible tops to various automotive interior repairs. Most of these services ranged in price from $1.00 for basic trunkstrap repairs to as high as $60.00 complete convertible top repairs. Perry relocated the shop to the current location on Melrose Avenue, just blocks from the original location, in 1979. Heart complications prompted Perry to officially retire in 1982 but continued to assist every way possible through 1989. Today, these similar services may range from $10.00 to $600.00. Still within Perry's wishes to maintain a high level of quality services for the automobile industry in Roanoke, VA. His son, Mahlon currently owns and operates the shop with his two sons assisting. Additionally, several of the staff Perry trained are still practicing the profession over 20 years later - (Tom Dickerson, General Manager; Joe Kelly, Trim Manager; Jim Molter, Service Manager). Until his passing Perry enjoyed working his Angus Farm and visiting with family, friends and WWII buddies. Please take a few moments to think of Perry for his contributions to his Family, the Automobile Upholstery Industry and the United States. From the humble beginnings of learning the trade on 11th Street in Roanoke to serving the community in the National Guard and the Roanoke City Fire Department, Mr. Maxey has expanded the business to what it is today. Along with the help of Perry, Dad or Pops, as we call him, moved the old location on 11th Street to the current location at 2412 Melrose in Roanoke. Once he purchased the new location in the late 70’s and large multiple car service facility was added to the old ESSO gas station and was renovated to meet the needs of the shop’s growth. He fostered local and industry relationships to enhance product offerings and services including Dealership and other related fleet work on a regional basis. To this day he is active in running the business while training and educating the future of the automotive upholstery trades. David returns to the family business after several career enhancing opportunities in the Connected Car (GPS Tracking), Window Film and Paint Protection and Automotive Dealer Vendor Industries serving in Sales, Product Management and National Account Management. His efforts will focus on the sales and marketing and dealership relationships across the State of Virginia. When not helping coach the local boys and girls ice hockey program and spending time with the family adventuring across the USA, David would love to discuss automotive industry trends for the dealership and the consumer. David is a Graduate of Radford University where he completed an Internship with the United States Olympic Committee and also completed 2 years of Undergraduate work in the Aviation Field at Embry Riddle University where he lettered as Member of the Golf Team.